Vero Vellini® has developed a multi-purpose cartridge and shell holder designed for fast easy access, comfort and convenience. The Vero Vellini cartridge case is created by old world craftsmen and completely assembled by hand. Vero Vellini® has developed a multi-purpose cartridge and shell holder designed for fast easy access, comfort and convenience. The Vero Vellini cartridge case is created by old world craftsmen and completely assembled by hand. Designed for fast access, the cartridge case allows for quick one-handed operation by use of a unique magnetic locking clasp on the case cover that keeps your cartridges clean. 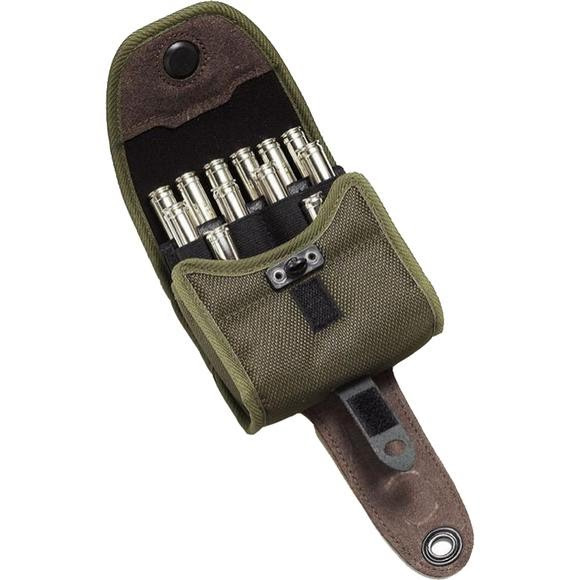 The standard case includes a 12 cartridge insert sized for most big game cartridges. Other inserts are available in various combinations. For added security, the elastic inner cartridge insert locks in so it cannot be pulled out when reaching for a cartridge. This inner shell holder can be entirely removed and the outer case can also serve as a belt attachable camera or tool case.